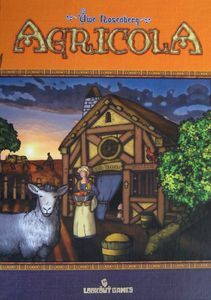 Buy Agricola and PriceWatch, Buy this board game at the Lowest Price. Agricola is an agricultural farming board game designed by Uwe Rosenberg, in the vein of the German-style strategy board games. Players control a plot of farmland, and compete to create the most balanced farm consisting of various types of vegetables and animals. Agricola took the gaming world by storm when it was released at the Spiel convention in 2007, and won the Spiel des Jahres award for Best Complex Game in 2008. It has been consistently popular since then, and is still the second most popular board game out there, as measured by the popular board game website BoardGameGeek. It has even managed to take the number one spot away from Puerto Rico for a while. The objective in Agricola is to build the best and most-balanced farm after 14 turns. You score the most points for having a farm with a big family and sturdy buildings, and efficiently using all your available farmland to plant vegetables and raise animals. This is not quite that simple to achieve however, since you start with just a farmer and his wife, with only a 2-room farmhouse, and there will be other players who are going to try to grab the resources to improve their own farms too! In the 14 turns of gameplay, there are a number of actions that you can do to grow your farm. You can grab supplies of resources such as wood and clay, and agricultural resources such as vegetables, fish and animals to lay the foundations of your farm. You can also plough and sow your fields, or fence them up, or bake some bread to feed your family. You can also grow your family when the time is right. Which action you choose (and when you choose it) will ultimately determine how successfully you grow your farm. However, it won't be possible to choose an action whenever you want it. Once a player has taken a particular action, that action is no longer available till the next turn. So you will need to plan which actions are the most crucial for your strategy and focus on them, and you will also need to be flexible and alter your strategy in case the other players take an action you need. In addition, you can take a number of actions each turn equal to the number of family members you have, so a big family is crucial. But you'll have to make sure you are able to house and feed those extra kids before you can grow your family. The resource market in Agricola is also quite interesting. There are actions where you can grab resources such as building materials, food, vegetables and animals. These resources replenish each turn at a set rate, and can pile up if a player doesn't grab them the previous turn. You could therefore wait for resources to pile up before you use an action to grab them. Or you could do the opposite and monopolize a resource market. For example, you could keep taking all the wood, and by doing so you would prevent the other players from building fences or wooden buildings. (You might also end up having too much wood, but that is beside the point). What makes Agricola such a great game is its endless replay value. Besides having the standard actions, each player also gets a random hand of occupations and minor improvements that they can play. These cards provide benefits that will impact how your play. For example, you might have a shepherd occupation that provides you with extra sheep, causing you to change your strategy to make sheep your primary source of food. These occupation and minor improvement cards also perform another function that makes Agricola a game for everyone. If you want to play it as a family game with children, you can use the easy deck of cards which provides bonuses that are easy to grasp. You can use a more complex deck with more interesting effects for players with more gaming experience. Or you could use an interactive deck where players can benefit from other players' actions or even steal resources from each other! Agricola has such a strong appeal because it can cater for playing groups of varying ages and gaming experience. The game is playable with 1 to 5 players, and games usually take about two hours, providing enough complexity without eating up too much of your time. It appears to be the best farming strategy game currently available, and deserves its spot as one of the most popular board games out there!